Puur Smaeck is known to be a special meeting place. Not just by the residents of Hilversum, but also by tourists and the shopping public. The restaurant is located in a monument in the Kampstraat, in the centre of Hilversum and closeby the station. That makes it the ideal place to begin or end your journey. 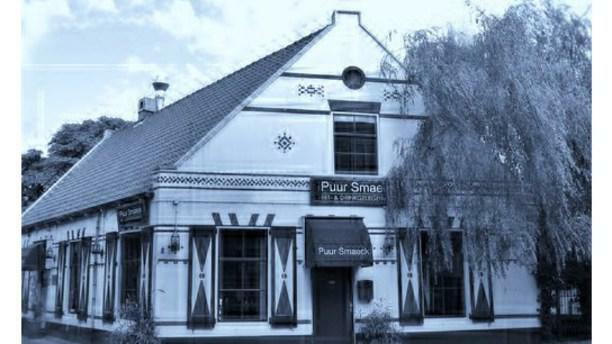 So get acquinted with their rich menu and fantastic hospitality that Puur Smaeck thrives on! Uitstekend restaurant met goede bediening. Hier kom je terug! Chefs are trying real hard to put something great on the table, which in fact is the case, it was wonderful. We really enjoyed our visit at Puur Smaeck yesterday. The food was delicious, the meals were well thought through and sometimes even surprising. For two three course meals of this quality 30 euros is a real bargain, thanks to the AH discount deal. The staff were friendly and attentive. The times between serving different meals were perfect, giving enough time to rest and prepare for the next course. All in all, it's a 10/10 for us. It's the second time we ate there and will definitely come back, even without the discount deal. This restaurant has a really homey atmosphere. The three course menu was fantastic. The worker were very kind. I'd like to go there again soon.